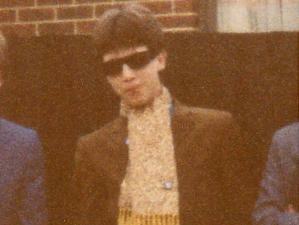 Paul Weller and I go back a long way. I was barely into my teens when I first heard Weller - singer, guitarist and major songwriter for The Jam. A friend of mine returned to Adelaide after spending a few years in England, and he brought with him a swag of records by Weller and Co. After sitting around in my bedroom for hours on end, listening to this new music, I knew I was smitten. The Jam would be ‘my band’ for the next four or five years. The Jam were, arguably, the most successful of all the punk/new wave bands, and their fame in England grew exponentially. After establishing themselves with their classic third album, ‘All Mod Cons’, The Jam’s powerful yet accessible songs were a hit with alternative and mainstream fans alike. It seemed they could go on forever, soaring to new creative heights with every new recording. Weller had a different idea – he called it quits. After breaking up the band and forming the Style Council, Weller drifted away from the punk/new wave sound of The Jam and embraced soul, jazz and funk-oriented grooves. 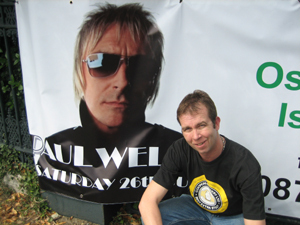 I drifted away from Paul Weller. After the Style Council’s meanderings led them into a form of oblivion, Weller more or less disappeared from view. At this point, most of the critical and public acclaim he’d earned throughout his time in The Jam and the early Style Council had evaporated. He’d disappeared from my radar too, at least as a contemporary artist. Weller’s first solo album came and went without any great fanfare in 1992, but in the fifteen or so years since then he has released album after album – many of them great, some slightly less so. Somehow, he has become the spokesman for a generation. His and mine. Paul Weller’s songs cover a broad range of genre and sentiment. The first records by The Jam were released in the context of punk Britain and, as fine examples of those frantic times, were fast, furious and generally uncompromising. In the midst of this cacophony, the angry young man showed that he did have a softer side, with most albums featuring at least one song that dealt with matters of the heart, presented against a slower, acoustic backdrop. As Weller has aged, it gets harder to pin a label to his work. His albums come and go, and the buyer is never sure what each aural adventure will bring. He has penned many modern classics over the last 30 years. Songs such as ‘Going Underground’, ‘The Eton Rifles’, ‘That’s Entertainment’, ‘Town Called Malice’, ‘You’re the Best Thing’, ‘Sunflower’, ‘Wild Wood’ and ‘The Changingman’ are favourites of many. He is rated alongside such songwriting luminaries as Ray Davies, John Lennon and Pete Townshend. He is the bridge between Paul McCartney and Noel Gallagher. You cannot pick up a copy of an English music magazine without seeing his face. He has been afforded living legend status by just about anyone who matters. Not everyone is convinced about Paul Weller’s importance. Some see his deity-like status as worthy recognition for a lifetime’s service; others see it as the artificial elevation of an average artist. I’m sure Weller isn’t bothered; he just keeps on writing, recording and performing. It is amazing that he is relatively unknown in Australia. Perhaps it is the unrepentant Englishness of both his sound and sentiment that gets in the way. I am an unabashed fan. The Beatles aside, his music probably means as much to me as anyone’s. I’ve waited years to see him live in concert. As he is not well known in Australia I have always felt that the only way I’d ever see him perform was to head to England. I panicked a little. I gave semi-serious thought to moving our trip a few weeks in either direction, but it simply wasn’t feasible. What to do? I jumped onto the internet and after some searching I found some tour dates – it seemed that he was playing one show on the Isle of Wight just before embarking on his Australian tour. 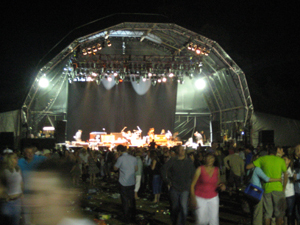 The concert was scheduled for the weekend we had planned to leave Australia. Could we move our dates a little? Could we get tickets to the gig? Of course we could. We moved our flight; I booked tickets to the concert, found accommodation nearby, and booked the ferry over. Job done. 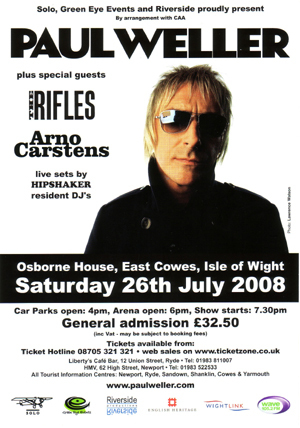 I was going to see Paul Weller on the Isle of Wight, home of so many famous gigs over the years. 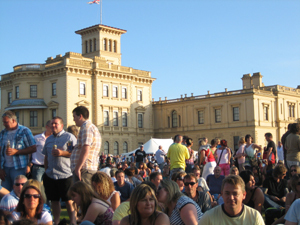 On Saturday 26th July we walked into the grounds of Osborne House, the one time summer residence of Queen Victoria. We’d been in England a little over 48 hours. Even though we were early arrivals at the venue, the crowd was already impressive. It was beautiful summer’s evening and expectations of a great night ran high. The majority of the concert goers seemed to be around my age, which indicated that they were long-time fans, and the hair and clothes indicated that they were of a similar demographic. I felt that we were among friends. The gates finally opened, the crowd moved forward, and suddenly we were through. No-one seemed remotely interested in seeing my ticket. 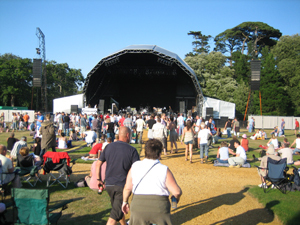 The stage was at one end of the huge gardens, so we immediately made our way towards it. 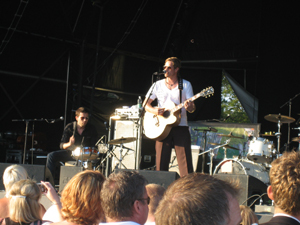 We sat down on the lawn about twenty feet from the front, and enjoyed the performances of the two support act - Arno Carstens and The Rifles. As the light faded, the DJ - Hipshaker - played classic mod songs and helped prepare the crowd for Paul Weller. There is that great moment at concerts just before the headline act sets foot onto the stage, and this was no exception. We held our collective breath as the announcement was made, the band came on and then, finally, Weller emerged from the rear of the stage and took his spot. This was what I had come 12,000 miles for. The crowd erupted when the band launched into ‘The Changingman’. The sound was great – loud but audible. A good mix meant you could hear the vocals clearly while still appreciating the full force of the band. The band knew its stuff and the show was delivered with power, skill and soul. Weller played songs from his long history, peppered with selections from his new album, “22 Dreams”. The crowd were in his hands from start to finish, and seemed especially pleased with the cracking rendition of ‘Eton Rifles’, from The Jam’s 1979 ‘Setting Sons’ album. 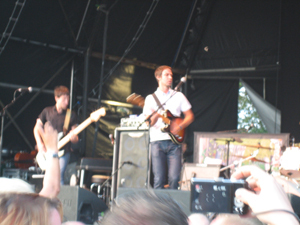 Other high points included ‘Wild Wood’, ‘Peacock Suit’ and ‘Shadow of the Sun’. There were moments when I questioned the wisdom of getting so close to the stage, especially as more and more fans surged forward. Ultimately, it was great to be in such close proximity, and what’s a bruised foot between friends? At some point I was hit on the head by a (plastic) bottle, launched towards the stage from someone in the rear. I didn’t care. Weller smoked and drank through the performance, looking fairly relaxed, even blessing the crowd a couple of times. There was a hint of temper when an early blast of feedback earned the sound person responsible a glare (and might have cost them their job) but otherwise it was smiles all ‘round. I sensed that I was watching an artist at the top of his game, which is strange seeing as Weller has been doing this for over thirty years and he’s just turned fifty. The songs from his new album are just about as strong as those from any other period; they certainly held their own when performed at the concert amid highlights from the Paul Weller back catalogue. 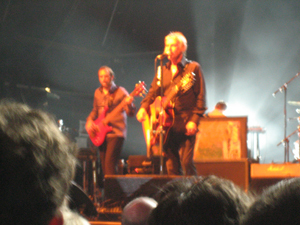 After the best part of two hours, Weller finished with a second encore – a version of ‘All You Need Is Love’ which segued into The Rutles’ affectionate parody, ‘Love Life’. And, with that, he was gone. The crowd made their way out of Osborne House on foot or on their scooters; everyone I saw seemed happy and satisfied. Some were on their way to the ferry; others were staying on the island. The two of us were staying just across the road, thanks to some good luck with accommodation. After a short walk it was time for a little reflection over a drink before falling asleep, comfortable that I’d realised yet another of my dreams. My hearing was still a little woolly the next morning but I didn’t mind at all. 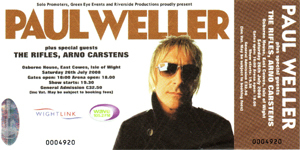 I hope it’s not 25 years until I see Paul Weller again. Set list: The Changingman, 22 Dreams, From the Floor Boards Up, All I Wanna Do (Is Be With You), Out of the Sinking, Sea Spray, Porcelain Gods, Push it Along, Picking Up Sticks, Wishing on a Star, Instrumental, Broken Stones, Have You Made Up Your Mind, Peacock Suit, Invisible, You Do Something To Me, Wildwood, Echoes Round the Sun, Come On/Let's Go, The Eton Rifles. Encore 1: Wild Blue Yonder, Shadow of the Sun. Encore 2: All You Need is Love/Love Life.